Connecting the creative community through collaborative content. In 2008, Tina Roth Eisenberg started CreativeMornings in New York City with a simple concept: breakfast and a short talk one Friday morning a month. Every event would be free of charge and open to anyone. Since then, CreativeMornings has grown to over 170 cities around the globe. In 2015 I joined the HQ team in Brooklyn as Design Lead, and that fall we launched a brand new project: The CreativeMornings Podcast. Problem: We had thousands of hours of video content archived on the site, but much of it was forgotten, aside from a few trending talks. Solution: Make old content fresh again by presenting in a new accessible format with new insights from the speakers and notes on creativity from the CM community. 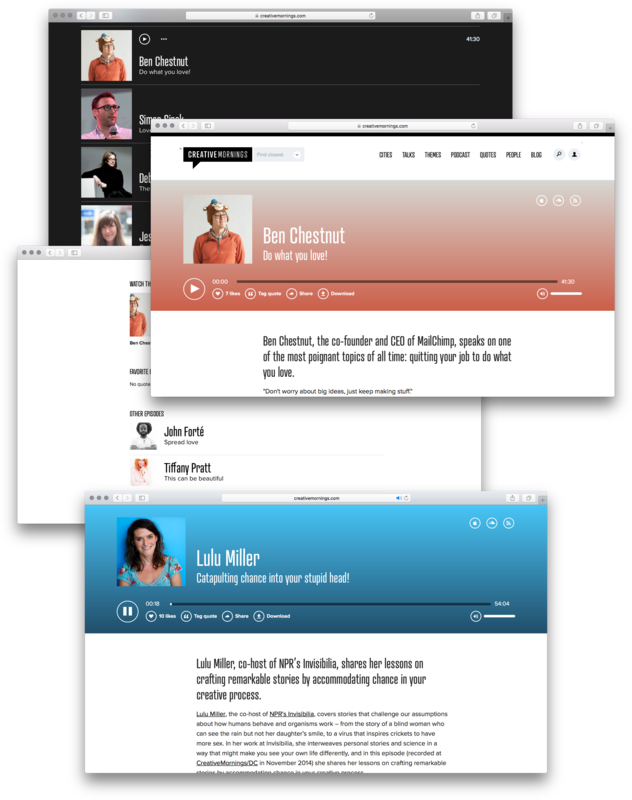 I designed a web UI with a custom audio player, where we linked up related video content and taggable quotes. Every episode page has a unique color scheme and quick links to download the audio to iTunes, Soundcloud, or an RSS feed. The podcast is now in its third season! We also worked extensively with CreativeMornings’ Global Sponsors, creating branded campaigns or month-long activations. I designed and launched CreativeMornings Skills in partnership with MailChimp, a project where we asked people to share a 2-minute video that teaches a skill (any skill) to help promote mentorship within the global creative community. 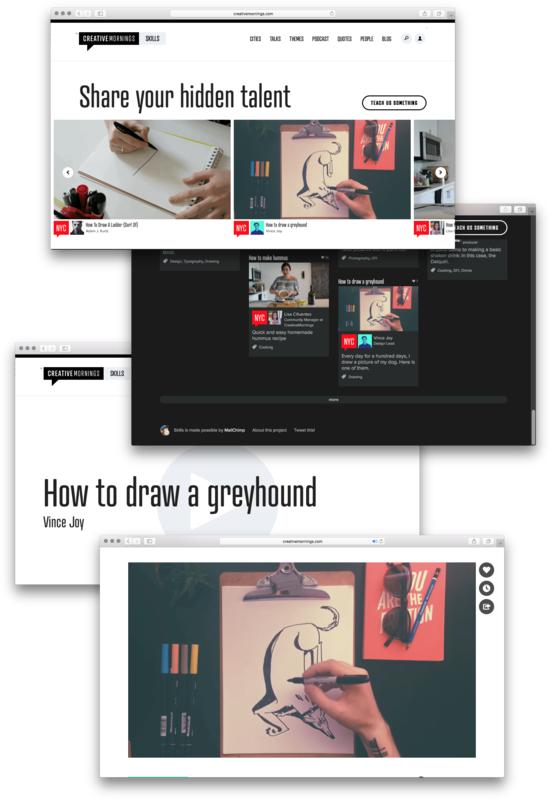 I helped seed the project with a video of my own — How to draw a greyhound, featuring Jack as himself. Shot on an iPhone suspended above my desk with a DIY contraption made of two Ikea chairs and a yardstick.